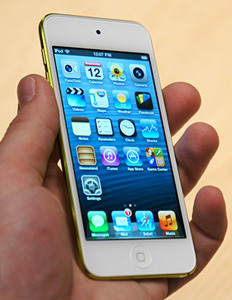 Apple has unveiled the new 4G-ready iPhone 5 with a larger screen, lighter and thinner than the iPhone 4S. Apple Inc CEO Tim Cook, today officially unveiled the new iPhone 5. The phone has a 4-inch “retina” display, ability to surf a high-speed 4G LTE wireless network, and is 20 percent lighter than the previous iPhone 4S. The phones will now have a smaller and faster “Lightning” connector, but don’t worry, there’s an adapter for that. Apple also confirmed that it’s replacing Google Maps with its own Maps app that can handle turn-by-turn navigation. Users can now use the Siri voice command feature to create and post messages to Facebook. The latest iPhone comes as Apple tries to fend off competition that has reached fever-pitch. Google Inc’s Android has become the most-used mobile operating system in the world, while key supplier and rival Samsung Electronics has taken the lead in smartphone sales. The iPhone 5 will hitch a ride on the three largest U.S. carriers — Verizon Wireless, AT&T Inc, and Sprint, marketing chief Phil Schiller told a packed auditorium at the Yerba Buena Center in San Francisco.